What & Where is The Center in Martial Arts? Many martial arts talk about The Center. So what exactly is the center? and where is it? The Center is the place where someone can be pushed, moved or thrown with almost no effort. …and if you hit them there it’s a serious problem. In an external art this is often the physical center of someone’s body. Their center of gravity or leverage point. …and it’s mostly in the same place every time. The Internal Arts aren’t so simple. Now, we’re talking about the center of someone’s intention and energy. It can move, change and even disappear. So what’s with this fortifying, moving and dissolving the center? This is one of the clearer distinctions between the internal arts. Xing Yi fortifies the center. Tai Chi dissolves the center. If you put your hands on a Xing Yi guy his center is solid. In fact it’s so solid that when you try to push it you’ll just get run over. When you put hands on a Bagua guy you can try to push his center. But every time you do it ends up being somewhere else. It keeps moving and twisting and is always just out of reach. When you put hands on a Tai Chi guy there’s simply nothing there. Like trying to push a cloud. If you only study one style or lineage, it doesn’t. You don’t need to distinguish between the different influences on your style. You simply focus on becoming the best imitation of your teacher that you can. But, if you study more than one art or you want to understand the an art as a whole. Then it is absolutely critical to understand the underlying principles that every flavor of the art is based on. And you must know where that art begins and ends. What it has in common with other arts and what is unique. This type of understanding takes time. Especially with all the convoluted information out there about the internal arts. 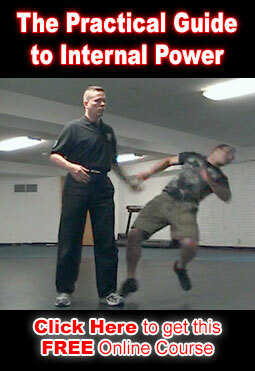 Our Internal Combat Arts course is very helpful in this way. …You start learning core internal principles like fortifying the center, moving the center and how to find someones center. You learn different ways each of these arts generate power. …and you get a clear look at many of the things these arts share as well as what sets them apart.